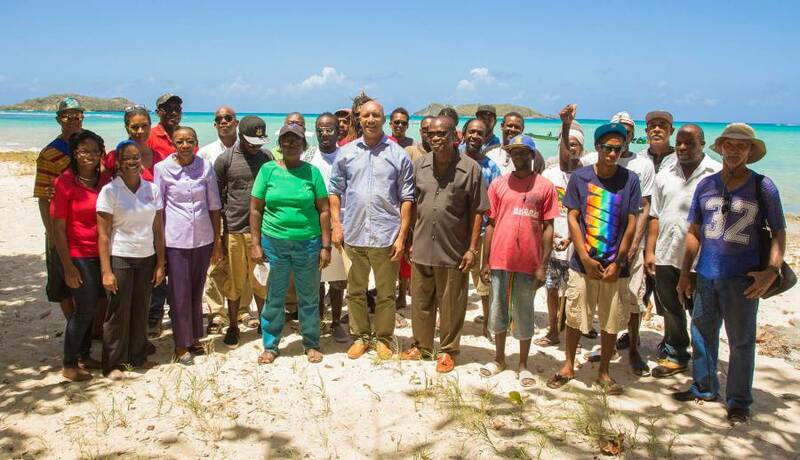 On Friday, 11 March 2016, the Carriacou Fisher Folks Inc. launched the ‘Feed the Future’ project, implemented by the Ministry of Agriculture, Lands, Forestry, Fisheries and the Environment in collaboration with the UNDP–ICCAS project. This project consists of deploying FAD (Fish Aggregating Device) farms around Carriacou and Petite Martinique and training workshops on FAD fishing techniques. The farms will have the capacity to be utilized by over 100 fishers daily. The training received will enhance the fishers’ appreciation to wisely manage their fishing stocks and habitat and develop resilience to climate change. The ‘Feed the Future’ project is a concept that aspires to feed minds and hearts with inspiration and new ideas, empowering the community of Carriacou and Petite Martinique to embrace opportunities to create new livelihoods and economic possibilities. It means feeding the very soul of the community. The deployment of the FAD farms will have an immediate effect on livelihoods of Fishers’ in Carriacou, and the Carriacou Fisher Folks Inc. are encouraged by the number of registrants for the training program and the general feeling of excitement and support being shown for the project. The ICCAS project is part of the International Climate Change Initiative funded by the German government to assist Grenada to adapt to climate change and is executed through the Ministry of Agriculture, Lands and the Environment.